Find out how you can quickly and easily create user-friendly online surveys. The internet is full of survey tools. Some are designed for broad-based research into consumer behaviour and others tightly targeted to deliver very specific information. Many offer both, and the features often look exactly same. Some are free, some you pay for, and others offer free trials. Businesses use surveys for all sorts of reasons. They carry out market research to find out how their employees feel, find out why employees leave and understand what makes their customers happy. They collect client feedback, establish brand awareness, identify the impact of training and track the effects of change. They find out how much delegates enjoyed events. They generate sales leads. And entrepreneurs use them to spot trends and opportunities. Let’s face it, surveying online is a marketer’s dream. On the other hand it can be a challenge to figure out which tool is best. Obviously you need to bear in mind your business context and budget, goals, marketing strategy, tactics and plans. But what’s your next step in the decision making process? Here’s some straightforward expert advice about choosing the perfect survey partner. It’s good to know, before you start, the basic differences between free and paid tools, whether it’s a desktop tool or a mobile app survey. With free tools you can explore the potential and make an informed choice. But they have some disadvantages. If you don’t like ads, free tools might not be for you. They’re often funded by advertisers and contain lots of advertising. Free software can contain malicious code. It can also come with adware that automatically installs itself. And you can’t always download your data, which limits its relevance. And free tools usually come with fewer features, fewer benefits than the real deal. It’s a very good idea to actually read the Terms and Conditions so you know what you’re signing up for. Paid tools come with all the bells and whistles. You can ask more questions, and ask follow-up questions based on the answers you received from the original ones. Paid versions let you ask more types of questions, things like multiple choice with drop-downs, ratings, radio buttons and a lot more. They’re usually ad-free. You can download the data in various formats. And if your brand matters you can upload your own logo for seamless brand integration, something you don’t usually get with free versions. Let’s take a quick look at a few popular survey brands. Typeform is nice and user-friendly for users and responders. Their free version, the Core Plan, offers unlimited questions and answers, you can export data and do basic reporting, and it comes with plenty of custom themes and templates. SurveyMonkey is a big name in online survey marketing, intuitive and advanced with a wealth of features and AI included. The free version offers 10 questions across 15 question types, 100 respondents, templates and some low-level theme customization. Like SurveyMonkey, SurveyGizmo is really simple to use, looks good, and has a wealth of customisation options. You can ask almost 100 types of question, and customize them as you like. The interface is feature-rich and you don’t need a degree in computer science to drive it. Their free version offers unlimited surveys and questions, 50 respondents, a few basic question types, basic reporting, templates and export to CSV. Google Forms connects your data with the other Google products you might use, and it’s free. The drag-and-drop makes it super-simple to create surveys and you can 100% customize them. You also get real-time charts and response insight. There isn’t a Bing alternative yet, but hopefully there’s one in the pipeline. WebEngage delivers loads of customization potential, plug-and-play layouts, and questions branched logically. It lets you target specific people based on the way they behave, and collects stats like survey attempts and completion. It also provides details about each response and lets you schedule reports. FluidSurvey is an enterprise-grade offering for data professionals, neither easy to use nor cheap. Zoho Survey does a great job of opening up the survey marketing basics to small businesses and start-ups. Their free version offers unlimited surveys, 15 survey questions and 150 responses. The LimeSurvey questionnaire tool is as basic as it gets. It’s Open Source, so free. Unlike some free options you can do limitless surveys and collect unlimited responses. You can add-on extra templates and question types if you like. The downside – if you’re not techie – is you might need technical support since there’s back-end work to do. Client Heartbeat is at the expensive end of the line and focuses on retention. It comes with advanced reporting features, alerts about unhappy customers, benchmarks for satisfaction, testimonial widgets and more. Mopinion is a customer feedback analytics tool offering online surveys, in-depth analysis, real-time data visualisation, customizable dashboards and charts, and crunches considerable amounts of data with ease. Survey Nuts lets you ask three questions as standard, more if you wish. You can test the system without setting up an account. All you do is add your email address and they save your survey, create an account and give you a survey link. The Customer Thermometer system is one of the most comprehensive. It lets marketers embed buttons into their favourite apps, connecting with helpdesks, ITSMs, CRM apps and more. It generates HTML snippets to paste into applications, which you can customize to trigger workflow emails. 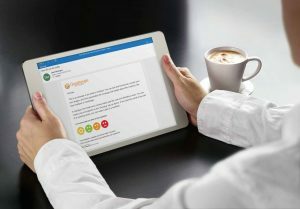 You can include Thermometers (surveys) in your email signatures in Outlook, Gmail or any other email client, to get continuous insight into your customers’ feelings. It’s easy to set up and everyone using the system gets their own unique signature to track their progress. Initially anonymous, you can ask for someone’s email address after a click. You can upload customizable Email Thermometer Survey templates along with recipients and associated data like the relevant Account Manager, customer type and so on. Then send your 1-click emails and collect the results. It’s so easy that as long as you can use Word, you’ll be fine. Most new users take just 5 minutes to get to grips with it. You can tap into a huge resource of icons and rating graphics, or upload your own designs. You can personalize feedback requests. Make timed and reminder blasts. Measure and report on your Net Promoter Score. Create beautiful thank you pages that prompt feedback and comments. And do it all responsively across multiple platforms. All of which makes it the best survey software around. Having read all that, are you still in the market for a free survey app or free online survey tools? It might make a lot more sense to sign up for a free trial with a really good, high-rated provider and enjoy exceptional quality right from the start. Looking for a comprehensive, versatile survey tool that’s super-easy to use? The Customer Thermometer free trial account is simple to set up and use. All you do is enter your email address and a password to create your free account. You can send 10 free surveys straight away via your fully-functional trial account that delivers your results in ten minutes. Then take action on any client feedback to experience the system’s power for yourself. Your customers give their opinions quickly and simply using an intuitive traffic light system. A customer click takes them to a branded thank you page where they can leave more comments or click on social media buttons, all with a trackable hyperlink. The fully customizable surveys work on all mobile device. And you can include your logo and add icons, emoticons, traffic lights, numbers, check boxes and crosses. It really is super simple to setup your survey. Or add numbers for voting-style questions. Your messages are sent via secure servers so don‘t end up in people’s spam or junk folders. Because you can see individual data, you can take timely, targeted action. Great survey response rates – Guaranteed! The tablet thermometer is a clever online survey software innovation. It’s a one or two-tap feedback tool with comment input for iOS and Android, and it can be branded to your business. You set it up via a free Customer Thermometer trial account, then place a tablet where your target audience – customers or employees – can easily see it. All they do is click a single icon on the screen as they pass by, something that takes literally a second or two, and there you have it… a snapshot rating, along with comments if they want to leave any, that gets logged to your account immediately so you can analyse and act on it. It’s marketing gold dust, and you can test it for free. The iOS free survey app is another cool innovation, available for iPads at the Apple Store. It’s easy to set up and use and lets you capture responses online or offline, ideal for places with a bad Wifi connection and perfect for exhibition halls. People’s responses sync with your account when your Wifi connection improves. Alternatively you can use it on a touchscreen PC or Mac via a simple kiosk app. As free survey tools go, it’s well worth having. Online survey tools and survey software open up a dazzling new world of marketing and service-led insight that can take your business in the right direction and help you beat the competition. Give yourself your best shot with a free Customer Thermometer account. Get an account today and send your first Thermometer in just minutes.